The recording of today's webinar, "The Great War: Researching Your World War I Ancestors" by Michael L. Strauss, AG is now available to view at www.FamilyTreeWebinars.com for free for a limited time. If you could not make it to the live event or just want to watch it again, the 1 hour 47 minute recording of "The Great War: Researching Your World War I Ancestors" PLUS the after-webinar party is now available to view in our webinar library for free. Or watch it at your convenience with an annual or monthly webinar membership. World War I has passed from living memory into the history books, receding far enough into the distance to provide a genealogical challenge. In order to reconstruct the lives and locate the records of those who served, fought, volunteered, or were conscripted, we must rely on a vast but relatively unknown body of resources. Counting all combatants, the number of men who served in the Great War runs into the millions; needless to say, finding records on them in the two dozen countries that participated in the war is a daunting and laborious task--now made infinitely simpler with the publication of this magnificent guide to WWI service records. The only book of its kind, this ambitious effort to catalogue service records and related sources is international in scope, covering the soldiers of all countries participating in the war, from Britain, Germany, and France, to Russia, Canada, and the U.S.; and from India, Australia, and Japan, to South Africa and Brazil! This is a key to a motherlode of genealogical data and should grow in value as our need for WWI-era information increases. Right now it represents a whole new path in genealogical research, with fresh possibilities and discoveries at every turn. The first part of the book is designed to provide background on the organization of the military in 1914, the order of battle, how to use the records, and a general time-line of events, focusing on 1914 to 1918. The second part concentrates on the combatants, describing each country's armed forces, conscription history, and its military and naval records, and, to the greatest extent possible, their location. (Records that have been microfilmed and are available worldwide through the Family History Library System of the LDS Church are identified by roll number.) The third part of the book describes casualty lists and POW records, and provides a table showing changes in place names, while the final section of the book, an appendix, contains a glossary of abbreviations, Internet addresses, and a select bibliography of books in English. The disposition of personnel files varies from country to country, depending on privacy laws and archival practices. In some cases documents are held by a military archive, in others by a national repository. In a few cases, such as Great Britain, service files are in the process of being transferred from one agency to another. Whatever their disposition--and it is an important aim of this book to identify their disposition--the records covered here fall under the following headings: draft records, personnel papers, unit records, embarkation lists, death records and casualty reports, military parish registers, regimental returns, medal lists, entitlement lists, hospital registers, pension records, and diaries. A particularly useful section of the book, "Research Tips," describes the general organization of military records, the organization of those records in specific countries, and the condition and comprehensiveness of the records. With help from dozens of individuals and institutions throughout the world, in particular from libraries such as the Army Pentagon Library, the Navy Department Library, the Library of Congress, the Family History Library, the Hoover Institute (Stanford University), the Public Record Office (England), and the national archives of at least a dozen countries, the author has managed to compile a guide to WWI service records that is not only unique but totally comprehensive. She has taken a mountain of material and cut it down to size, transforming an unwieldy body of sources into a streamlined archive. Her pioneering efforts will save researchers untold hours of toil, adding limbs to family trees and providing opportunities for further research. Legacy QuickGuidesTM have quickly become one of the more popular resources for genealogists. Each guide contains four (sometimes five, sometimes more) pages of valuable information covering a variety of genealogy research topics, dozens of clickable links, and are written by genealogists and family historians who are experts in the subject areas. We've added another new Legacy QuickGuide: Scrap Paper and Orphan Documents in Archives by Melissa Barker. Now choose from 87 Legacy QuickGuides! Disasters happen everywhere. Natural disasters happen many times without warning and can be devastating. Manmade disasters can also happen without warning, but sometimes can be prevented. Genealogists who experience a disaster which affects the safety of their genealogical records know how destructive these disasters can be. It is important to protect and preserve genealogical records against the effects of a disaster. The Disaster Planning for the Genealogist Legacy QuickGuide™ contains useful information including the duties of the “Home Archivist,” creating a Disaster Preparedness Plan as well as how to deal with specific types of disasters. Also included are links to websites and resources covering archival resources and more. This handy 4-page PDF guide can be used on your computer or mobile device for anytime access. Join us and Michael L. Strauss, AG for the live webinar Wednesday, May 31, 2017 at 2pm Eastern U.S. Register today to reserve your virtual seat. Registration is free but space is limited to the first 1,000 people to join that day. Before joining, please visit www.java.com to ensure you have the latest version of Java which our webinar software requires. When you join, if you receive a message that the webinar is full, you know we've reached the 1,000 limit, so we invite you to view the recording which should be published to the webinar archives within an hour or two of the event's conclusion. Michael L. Strauss, AG is an Accredited Genealogist and forensic investigator, is a native of Pennsylvania and a resident of Utah. He holds a BA in History and is a United States Coast Guard veteran. He is a licensed Private Investigator and qualified expert witness in Surrogate Court and Circuit Court in Pennsylvania, New York, New Jersey, and Virginia. Michael is an approved genealogist with the United States Army to locate DNA qualified persons MIA from Korea, Vietnam, and World War II. He is a national genealogical lecturer and instructor for military courses at the Institute of Genealogy and Historical Research (IGHR), and Virtual Institute of Genealogical Research (VIGR). He was the film historian for the 2015 Academy Award nominated movie "Finding Vivian Maier". New Historic Records on FamilySearch - records from Chile, Denmark, Germany, Peru, Spain, Switzerland and U.S. This week's update brings good news to those with family from Peru with over 1 million newly indexed civil registrations available. Also, look through the large collection of recently indexed New York Passenger Lists. Search these new free records and more from Chile, Denmark, Germany, Spain, Switzerland, Utah, and New Hampshire at FamilySearch by clicking on the links in the interactive table below. The recording of today's webinar, "WikiTree: Free for All without a Free-for-All" by Eowyn Langholf is now available to view at www.FamilyTreeWebinars.com for free for a limited time. This presentation gives a general overview and introduction to the free collaborative family tree site, WikiTree. It will cover the site's mission and Honor Code, privacy versus open collaboration, genetic genealogy features, cousin bait, becoming a part of the community, and the benefits of membership. If you could not make it to the live event or just want to watch it again, the 1 hour 30 minute recording of "WikiTree: Free for All without a Free-for-All" is now available to view in our webinar library for free. Or watch it at your convenience with an annual or monthly webinar membership. Legacy Family Tree Webinars is honored to make available four presentations that were delivered during the Surname Society 2017 annual conference and general meeting. The presentations touch on the theme of migration and tracking your ancestors across the globe. The Surname Society was founded as a not-for-profit entity by a worldwide group of experienced genealogists. The vision of the Society is to connect like-minded people by providing up-to-date facilities which enable members to share knowledge, data and good practice with others regardless of where in the world they are. The Society is entirely online and focusses on single surname studies to meet the needs of researchers in the world of family history and genealogy as it evolves in the 21st century. Americans have always been a nation on the move. There were many reasons that brought them here, and once they were here they didn’t stop. Something “out west” always seemed to beckon them. In this class, we will study the major trails used for migration, and the ethnic groups that predominately used those trails. Also included are major waterways, such as rivers and canals, that enabled people to move swiftly to their next destination. The class will finish with a case study showing the reverse migration of one of Peggy’s families, and the use of census and court records used to track the family back to its first landings in America. This class will suggest various avenues that can be explored by those who are in the process of giving their study a worldwide flavour. Australia was founded on emigration, initially forced emigration by the convicts to later the free settlers and post WW2, refugees and displaced person from Europe. Prior to Federation each colony was in charge of its own immigration schemes. This has produced a wealth of records, a case of following the money. Records were kept when the governments had contributed to passage costs. Living DNA launched in September 2016 offering the most detailed genetic ancestry test currently available to the general public. Working in partnership with the leading scientists in the field of human genetics the Living DNA test enables anyone to explore their genetic ancestry using the most detailed methods available. Currently, this fine structure analysis provides an individual with a breakdown of their ancestry across more than 80 global geographic regions, and over 20 regions within the UK. So download the update to get the best Legacy ever! Research Guidance hints are accessed by clicking on its icon in the My Toolbar tab. View the May 23 release notes here. Legacy Family Tree 9's new Cause of Death charts helps you visualize and see patterns of part of your ancestors' medical history. 1. From the My Toolbar tab in Legacy 9, click on the Legacy Charting button. 2. Select the desired chart style. Before creating the chart, you'll need to type the cause of death for the ancestor. Just open the person's Notes screen and click on the Medical tab. For a quick video overview of creating a Cause of Death chart, click below. Cause of Death charts are only available in Legacy Family Tree 9 Deluxe software. Join us and Eowyn Langholf for the live webinar Wednesday, May 24, 2017 at 2pm Eastern U.S. Register today to reserve your virtual seat. Registration is free but space is limited to the first 1,000 people to join that day. Before joining, please visit www.java.com to ensure you have the latest version of Java which our webinar software requires. When you join, if you receive a message that the webinar is full, you know we've reached the 1,000 limit, so we invite you to view the recording which should be published to the webinar archives within an hour or two of the event's conclusion. Eowyn Langholf was first introduced to genealogy by her mother when she was a teenager and quickly picked up the hobby. Over the years it evolved from a hobby to a career and Eowyn has been a professional genealogist for 8 years now. Her primary areas of focus are the United States, Germany, Italy, the UK and Spain. She especially enjoys helping adopted individuals try to find their roots. In addition, Eowyn is going on her third year as the Forest Elf of WikiTree. Her responsibilities include everything from administration to social media. As the owner says, they've stopped trying to track everything she does. It's a fool's errand for a mortal. 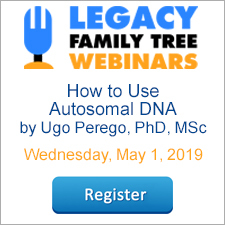 The recording of today's webinar, "Hands-On with Legacy Hints: Using MyHeritage Record Matches and Smart Matches" by Geoff Rasmussen and Mike Mansfield is now available to view at www.FamilyTreeWebinars.com for free for a limited time. 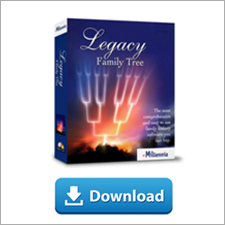 Legacy Family Tree 9 sifts through billions of records from the key websites to bring you relevant and promising matches for your ancestors. In this webinar, Legacy’s Geoff Rasmussen will review – LIVE! – some of the Legacy Hints that are waiting for him in his personal family file. This time, he will explore possible Record Matches and Smart Matches that MyHeritage.com has discovered for him. On hand to walk Geoff through his results will be MyHeritage’s Director of Content Operations, Mike Mansfield. He will also give an insider’s perspective into the technology that makes MyHeritage’s Smart Matching and Record Matching so effective. If you could not make it to the live event or just want to watch it again, the 1 hour 43 minute recording of "Hands-On with Legacy Hints: Using MyHeritage Record Matches and Smart Matches" is now available to view in our webinar library for free. Or watch it at your convenience with an annual or monthly webinar membership.